That my friends is an understatement. 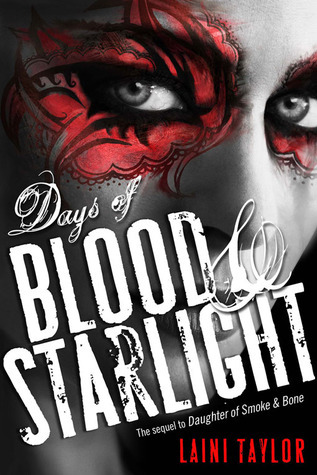 Days of Blood & Starlight, book 2 in the series is dark. Very dark. Extremely dark. Very, extremely dark. It was hard to read the first half of the book, to watch Karou be broken from the loss of the first book. Karou’s quaint and small life of collecting teeth is over and it was hard to ‘witness’ the shell of herself. Yet, as the story progresses, Taylor does an exceptional job of taking Karou from this helpless shell to an astonishingly formidable opponent. Although Days of Blood & Starlight is dark, (have I mentioned that?) Taylor balances it will with the concept that hope is unkillable. Book 3 here I come. This entry was posted in Fantasy, Monsters, Young Adult and tagged Angel, Daughter of Smoke & Bone Book 2, Days of Blood & Starlight, fantasy, Karou, Laini Taylor, monsters, Young Adult. Bookmark the permalink.